Story Contracting and Story Homes have joined forces to renovate Carlisle Eden Mind’s Lighthouse, as part of our two-year commitment to support mental health charity Mind. 18 subcontractors who work alongside both Contracting and Homes have kindly offered their materials, labour and time to help renovate The Lighthouse to make it a more comfortable area for those who need to use the facility. A number of staff directly employed by the two businesses have also donated their time to help with the refurbishments, with the overall investment in the project equating to almost £30,000. 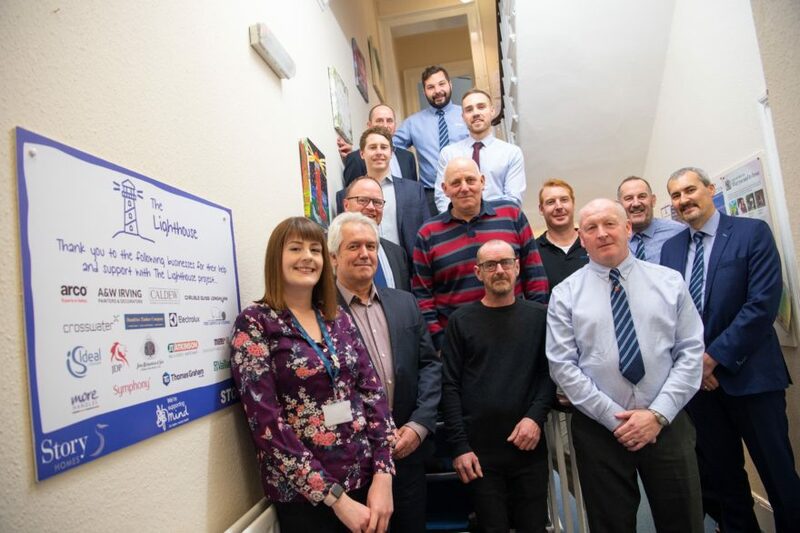 The Lighthouse, which is based in central Carlisle, offers a safe, calm and homely environment for people who are in mental health crisis and need to find ways of coping or need help with keeping themselves safe. Those involved in the renovations were invited to a re-launch event yesterday where they visited the newly refurbished Lighthouse and chatted to some of the volunteers who work there. The Lighthouse renovations that have been completed include; a new fully fitted kitchen and appliances, new carpets and flooring, a new fully fitted boiler, new sanitary ware and much more, as well as labour time throughout the duration of the project and cash donations. Mind is a mental health charity that provides advice and support to empower anyone experiencing a mental health problem, campaigning to improve mental health services, raise awareness and promote understanding, and sister companies Contracting and Story Homes will be supporting Mind as their charity partner until 2020. A recent ONS study (March 2017) found that, in England, the risk of suicide amongst those working in construction roles was three times higher than the male national average. The two-year Story charity campaign also ties in closely with our wider business goal of increasing the awareness and understanding of mental health conditions and removing the associated stigma. 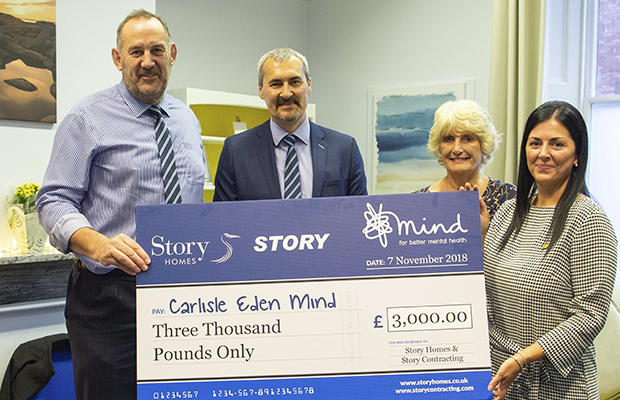 At the re-launch event, Story Homes and Story Contracting also presented Carlisle Eden Mind with a cheque for £3,000 which has been generated from the two businesses’ ongoing fundraising efforts for the charity. Tara Quinn, Chief Executive Officer of Carlisle Eden Mind, said: “We would like to say a huge thank you to Story Homes, Story Contracting and their subcontractors for the hard work and donations they have contributed as part of The Lighthouse renovation. For those with lived experience of mental health and anyone experiencing a mental health crisis, the world can be a very lonely and scary place, and our new and improved Lighthouse building will ensure that visitors have a warm, safe place to come where they can be listened to and supported with respect and without judgement. Story Contracting and Story Homes would like to thank the following businesses for their support with The Lighthouse project: A&W Irving Painters & Decorators, Arco, Border Brite, Caldew Plumbing, Carlisle Glass, Crosswater, Dumfries Timber, Fine Carpets & Flooring, Ideal Standard, JD Pipes, John Richardson Timber, JT Atkinson, Miers Construction Products, More Handles, Symphony, The Electrolux Group, Thomas Graham and Vaillant. The Lighthouse, on Spencer Street near Carlisle city centre, is a partnership project between Carlisle Eden Mind and Glenmore Trust and is run by staff and supported by volunteers. It is open from 6pm to 11.30pm every day of the year and visits to The Lighthouse are by appointment only. It can be reached on 0300 5610000.